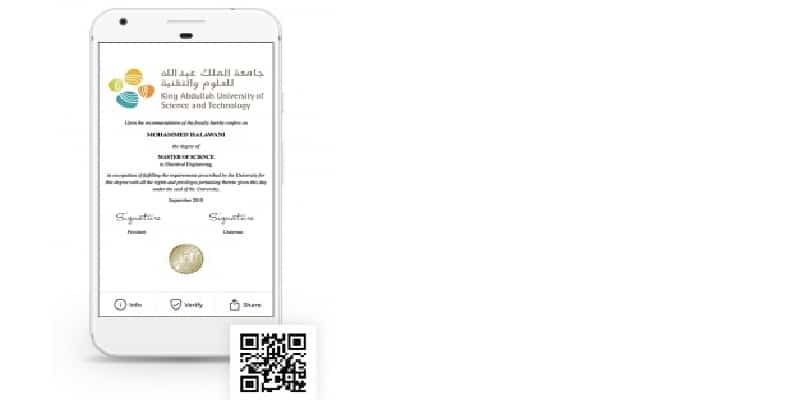 In a major step forward for the adoption of blockchain technology by educational institutions, King Abdullah University of Science and Technology (KAUST) has announced that it will become the first institution in the Middle East to issue Blockcerts, blockchain-anchored credentials. The move will position KAUST among pioneering universities around the world, including MIT, the University of Melbourne, Central New Mexico Community College, and others. Digital diplomas will be issued to all KAUST students graduating in December 2018 using the Learning Machine Issuing System. The diplomas will be anchored to the blockchain using Blockcerts, the global open standard for portable, secure, and digital records that can be verified as official for a lifetime without cost. Developed jointly by MIT Media Lab and Learning Machine, Blockcerts are now led by a global community of contributors. This move will set the university at the forefront of the digital transformation happening in the Kingdom. The advantages of using Blockcerts include offering a faster, simpler, and more secure way to issue official records, validate documents and verify identities. This provides issuing institutions and recipients with lifelong ownership of their credentials without relying on a software vendor for ongoing access and verification. The flexibility of Blockcerts means that documents can be anchored to any blockchain: public, private, or permissioned. Recipients receive, store, and share their digital diplomas via their Blockcerts Wallet, a free mobile app that acts as a private credentials portfolio accessible exclusively by the recipient. The recipient may choose to share their Blockcerts with any employer, government, or educational institution in the world, instantly and free, for immediate verification.